The “Configure Rewriters” section of the console allows you to modify settings that PageSpeed Service uses for optimizing your website. 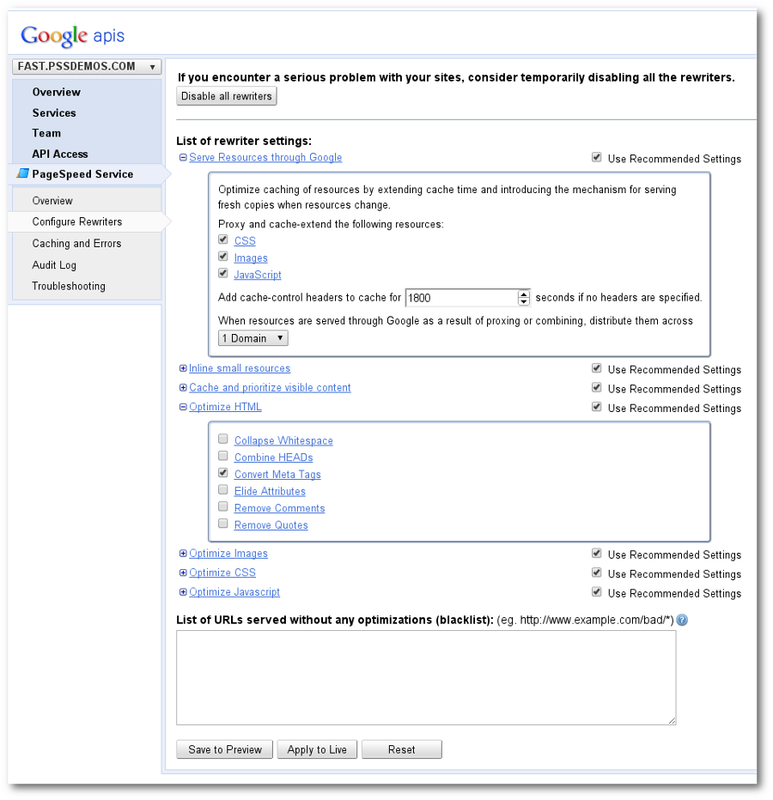 You can access it by logging into the Google APIs Console, and selecting the Configure Rewriters menu under PageSpeed Service. Click Exit to unset the preview cookie and exit the preview mode. Clicking Apply to Live applies selected settings to your site. Refer to the documentation for each of the rewriters to understand what they do. PageSpeed Service rewriters are grouped based on their functionality. For each group you can either use the recommended settings or configure individual rewriters manually. When recommended settings is selected, PageSpeed Service automatically enables rewriters as they mature in stability and performance. If recommended settings is not selected, you can enable any arbitrary set of rewriters under each group. Click on “+” to expand each group and enable rewriters individually. You can always revert to the recommended configuration by checking the recommended settings checkbox. If your web pages don't render correctly with PageSpeed Service and you are unable to identify the offending rewriter, click the Disable all Rewriters button and then the OK button on the confirmation dialog. In case of emergencies, we strongly recommend using this approach rather than making DNS changes, since DNS changes may take up to 48 hours to propagate fully. When you Disable all Rewriters your web pages will continue to be served by Google, but unmodified from the origin servers. This short video gives an overview of when and how to use the feature. Please write to pss-support@google.com and let us know of the problem you encountered with your web pages so that we can help you resolve the underlying issue. When you're ready to re-enable the rewriters, click the Enable rewriters button. The blacklist provides a way to tell PageSpeed Service to not perform rewriting optimizations on specific URLs for your site. The blacklist is global - i.e. it will disable all rewriters for the blacklisted URLs. If some of your pages don't render correctly with PageSpeed Service, you can blacklist them, while you troubleshoot the root cause and fix it. Wildcards are supported in blacklists. Here are examples of valid ways to specify blacklist URLs. Please note that specified URLs should begin with http://. You can also use the blacklist to disable rewriting on resources for which you do not have explicit approval to modify, such as due to copyright issues. For example, if you embed an image from a different site using <img src="http://www.anothersite.com/image.png"> and do not have explicit permission from the site owner of www.anothersite.com, you can add http://www.anothersite.com/* to the blacklist. If there is a problem affecting a large number of pages, disable all the rewriters and then try enabling them one after another to narrow down the problem. If the problem persists even after disabling all rewriters, you can blacklist http://* temporarily to allow all your pages and resources to be proxied through Google without even the default rewriters being applied to them. This should only be used as a temporary solution, while you invesitgate the root cause for the problem. You will not get any of the benefits of PageSpeed Service while in this mode. Note: Any changes made to the Domain or Rewriter Settings may take up to 10 minutes before they can be noticed on your site. Note that the procedure used to measure speed up before you used PageSpeed Service will no longer work. It will always show zero gains because that will measure the speed up of your site against itself. Please follow the instructions mentioned below to measure the speed up of your webpages after you have started using PageSpeed Service. Click on the button Check it Out at the bottom of the pane. Enter the URL of the webpage you would like to measure, say www.example.com.